This makeup look is featuring a few of the products I mentioned in my June favourites and although you may have seen a few mentioned already, I wanted to do this look and focus specifically on these 3 things... Fresh. Flushed. Flawless. This is just going to be concentrating on the skin, I won't be doing anything with the eyes, lips or brows or anything. 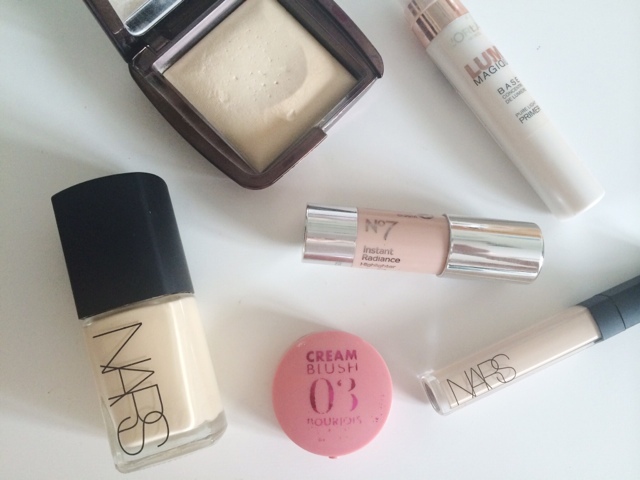 Starting with fresh, once you have applied your moisturiser, eye creams, primer/s etc. it's time for the skin. We're going for very luminous skin with this look so one of the primers I used was the L'Oreal Lumi Magique Base which gives a really pretty sheen to the skin which comes through your foundation slightly. 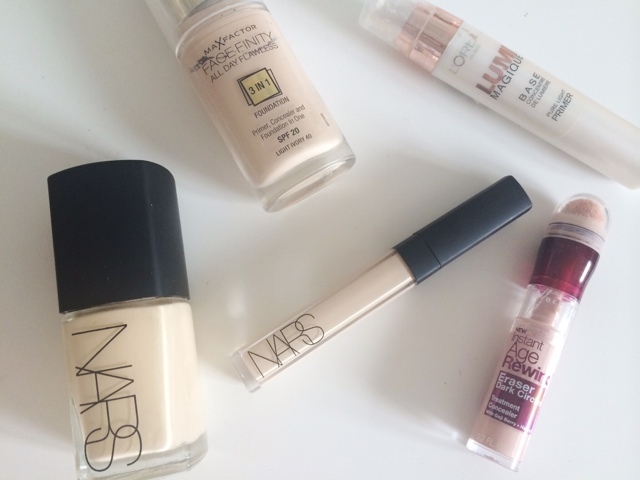 For foundation I am going to us a mixture of the NARS Sheer Glow Foundation and the Maxfactor Face Finity 3 in 1 Foundation. Once that is blended out, I then go in with concealer, and I don't want to do anything to heavy and full coverage as I want to keep this quite light and natural, so I first go in with the Maybelline Instant Age Rewind Concealer in Brightening and then on top of that, I use my most recent addition to my concealer stash and my new absolute favourite, the NARS Creamy Radiant Concealer. This gives a good amount of coverage, but as the name suggest, it has a radiance to it which looks so incredibly natural but does a really good job of covering my panda eyes. This, I know for definite is going to be mentioned so many more times so be prepared, I'm sorry, I just love it so much. Of course, this is where the blusher comes in. 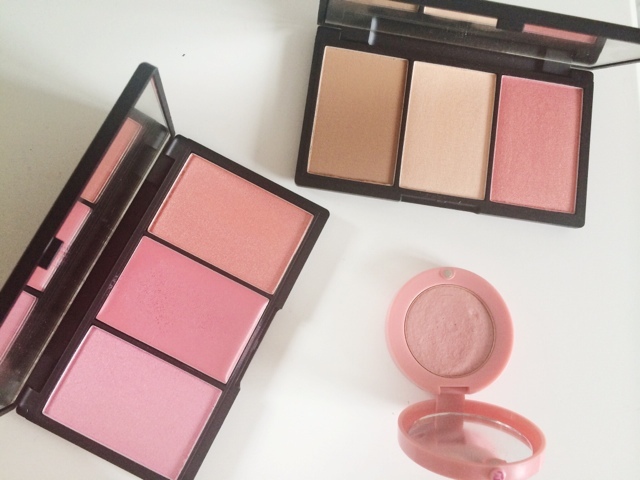 A cream blush has a very natural finish to the skin, as it gives a nice sheen and lasts pretty well in the summer. For the purpose of this post I'm going to use the blush from my June favourites which is the Bourjois Creamy Blush in 03, I don't know why I have gone to back to this but I just love the look and finish it gives, plus it lasts really well, all day in fact. Sleek Blushers are one of my favourite drugstore offerings and so any of their blushers I highly recommend and think would be absolutely perfect for this look. In case some of the dewey-ness from the primer was lost, I like to add a cream, subtle highlighter which will really bring those cheekbones out and keep the glowing theme of the look but won't be anything too OTT. 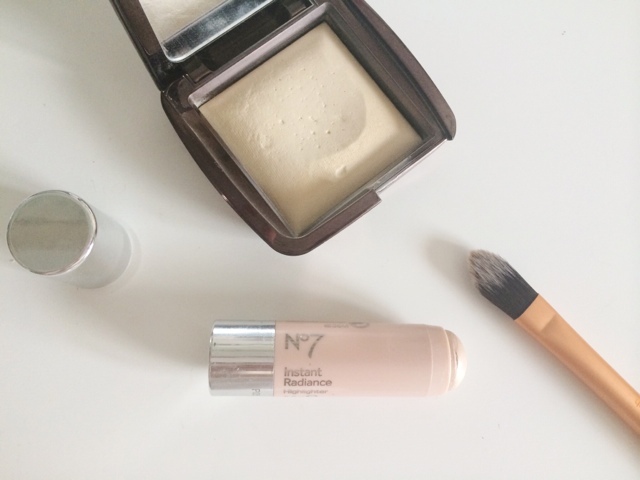 So I go in with the No7 Instant Radiance Highlighter, which I apply using the Real Techniques Pointed Foundation Brush as this is the perfect size, picks the product up really nicely and blends it in so seamlessly. A liquid highlighter is also perfect for the kind of look I am going for here as it gives a subtle highlight yet you know it's there. Making sure you have blended everything out so there are no lines, it's time to finish this look off. The Hourglass Ambient Lighting Powder in Diffused Light is the perfect thing for making your skin look completely flawless. The Ambient Lighting Powders were created to give a soft focus effect from a different flattering light source. This particular one has quite a yellow tone to it, it gives a luminescence to the skin and makes it appear flawless yet natural. I apply this all over the face and to be honest, I was a little sceptical at first, c'mon it sounds pretty far fetched, but this particular shade does work to some length and I am really keen to try some of the blushers from the range too. That's it. There's how to get fresh, flushed and flawless skin. 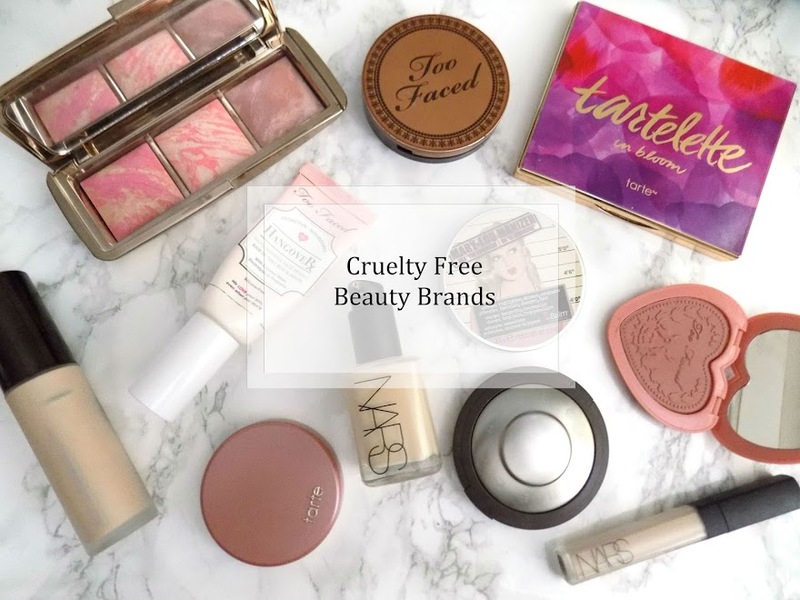 I hope you liked this kind of post and if you have any tips for any of these steps or some alternative products then please leave them in the comments. Thanks for reading guys. What are your favourite glowy skin products?